Throughout life we experience a lot of firsts. First steps. First words. First car. First speeding ticket in first car. And many more. Then there's the first time you visit Topgolf which has it's very own set of firsts. First time swinging a golf club while enjoying hummus. First time showing of that dance move you've only practiced in the mirror. And first time finding a place that everyone agrees is awesome. Share your email address, select your venue and we'll hook you up with $10 off game play to make that first time even better! *This promotion is valid for select venues through Sept. 30, 2017. Each email includes two separate coupons. 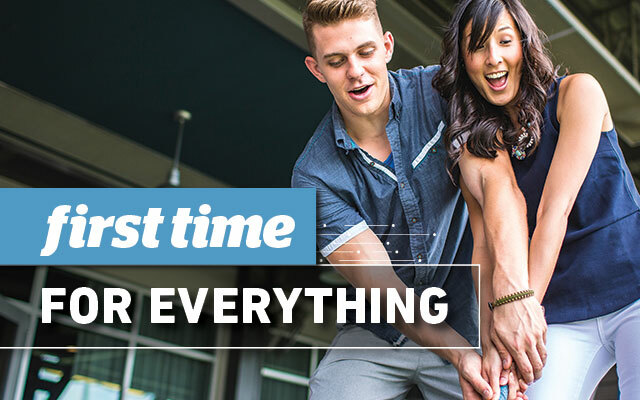 The first coupon is good for $10 off Topgolf game play. Must be redeemed at one of the participating venues listed in the drop down above. Cannot be used in conjunction with any event or party. May be used only once and applied to only one (1) membership. Only one (1) coupon may be used per group/bay. Cannot be substituted and has no cash value. Promotion subject to change. The second coupon is good for one (1) $5 Lifetime Membership. Excludes Topgolf Alexandria and Wood Dale. For new members only. Cannot be used in conjunction with any event or party. May be used only once. Cannot be substituted and has no cash value. Only available for redemption online.